I stumbled upon this piece of paper today, folded in six in the bottom of a keepsake box. Yes, it’s dated as the 15th of September 1994. 18 years old. Almost ready to become a museum exhibit. It has made its way from the zipped pocket of my tennis racket case, across an ocean, from house to house to … I can’t remember how many houses. And I still have it. Way to go! Six games in a row!!?!! Well, why not? But good adjustment, revised game plan, + hanging tough. 1) PLAY : Remember, it’s a game. Just a game. If it stops being fun, then time to quit, sell your racquet, and do something else. 2) TENNIS : Do it! Tennis, that is, not defensive cowering in the corner, not worrying about winning or losing, not the score, but doing tennis. 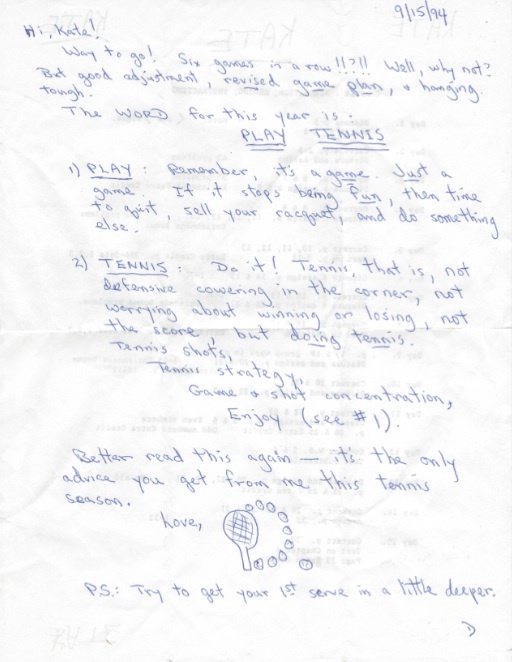 Better read this again — it’s the only advice you get from me this tennis season. P.S. Try to get your 1st serve in a little deeper. D.
I found this letter in my tennis case when I was 13. When I found it again today and realized afresh its lasting significance, I thought about the impact a single sheet of paper can have on a person. I thought about my own children, and the ways in which I may or may not be impacting, influencing and encouraging them. Think back on your own upbringing. Which words of advice from your parents stuck with you? Which words do you hear yourself repeating to your own children now? Most importantly, if you are a Christian, how can you use words in a lasting way to impact the next generation for His glory?